We have written before about the types of companies that choose to install solar and we featured the specific strides that IKEA is making toward energy independence. But now comes a report from the Solar Energy Industry Association (SEIA) and Vote Solar that shows that when it comes to saving money, solar really does mean business! 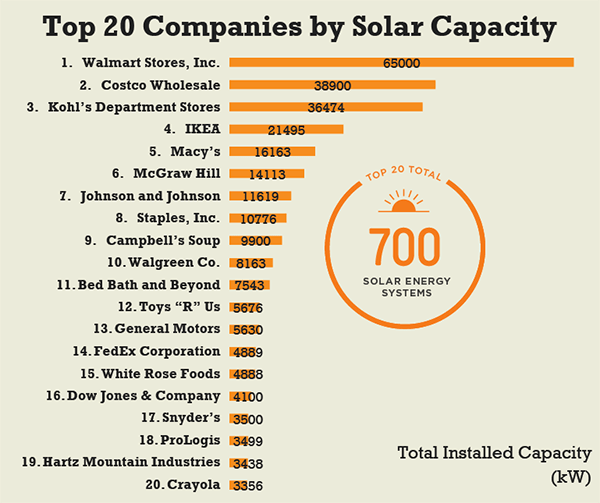 As the above chart shows, these twenty companies have installed more than 700 solar power systems with a combined total capacity of 279 MW, or enough to power more than 46,000 typical American households! Retail giant Walmart leads the way with 65 MW of installed capacity, followed by Costco, Kohl’s, IKEA and Macy’s. Indeed, the report shows that IKEA has installed solar at 79% of its stores, exceeding by mid-2012 the goal that it had set for 2015! What is motivating these companies to adopt solar at such an impressive - and accelerating - pace? Well, it certainly isn’t green-eyed environmentalism nearly as much as it is far-sighted economics. These companies have figured out that solar power systems are a great money maker - with paybacks occurring in 4-7 years and decades of savings thereafter. The good news is that your company doesn’t have to be a giant in the field to save money like one. Commercial solar is simply the smartest investment any company could make, and when combined with PACE financing (at least here in Los Angeles County) you can have all of the benefits of commercial solar with next to nothing out-of-pocket. So what are you waiting for? Give us a call or click on that giant “Go Solar Now” button on the right to get you started on the road to some major savings!